A very special event coming up at the end of this month, a rare chance to hear Chris McGregor's music played by many of the musicians that played in the Brotherhood of Breath in the 1980's such as Steve Arguelles, Claude Deppa Annie Whitehead and Chris Biscoe. Just finished the charts for Pigfoot Play Bacharach at the Vortex on Saturday 10th - really looking forward to playing these great tunes with Liam Noble, James Allsopp and Paul Clarvis. Have just fixed the first date - December 11th - for a new series of gigs at the Vortex entitled Pigfoot Plays.... The plan is that we will play a different genre of music each time, in inimitable porcine fashion. As it is nearly Christmas, the December gig will be Pigfoot Plays Opera. I am really looking forward to hearing what the band can do with Wagner, Puccini and Mozart. Had a great time over the last weekend at Brecon with Loose Tubes and Township Comets. Also did a masterclass called Trumpet Heroes from Off the Beaten Track, looking at some influential trumpet players. Here is the playlist for anyone who was there and wanted to follow up, or anyone else who might be interested. 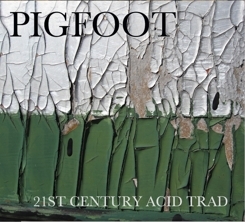 I am very happy to be launching the new Pigfoot CD at the Vortex on Friday, almost a year since we recorded it there. Fantastic playing from Liam Noble, Oren Marshall and Paul Clarvis, and equally impressive recording, mixing and mastering by Alex Bonney, Andrew Dudman and Sean Magee. Released on March 31st but available for pre-order on Amazon and iTunes, where you can hear previews. I am very excited at the prospect of playing at the Vortex this coming Sunday 27th January with my new AcidTrad band Pigfoot. We are playing a whole load of New Orleans hot jazz, spirituals and blues tunes that I have arranged for the group. We had a great rehearsal last week and the combination of Oren Marshall's pokey tuba playing, Paul Clarvis' hip old school drumming and Liam Noble's manically mangled stride playing makes a fantastic rhythm section. Anything could happen. Reviewers sometimes get the wrong end of the stick, or may alternatively offer an insight that you wouldn't get from the stand, but I generally don't have a strong urge to respond. Not so here, however, as this reviewer resorts to a tired cliché in the first sentence (Brazilians = football) and then proceeds to use the comparison to dismiss the British musicians out of hand throughout. Having compared the gig to an adversarial sport, Garry Booth then makes the casual assertion that the British band were ‘inevitably a little mechanical”. Why inevitably? He might have considered the actual material being played by each group, i.e. music scored for large ensemble as against music intended for a small group of soloists. Was it that the British players interpretation of the written music was mechanical, or that the he considered the big band material, in comparison with the small group repertoire, to be mechanical? A basic working knowledge of any renowned jazz composer’s output would confirm a significant difference between small group and big band repertoire; Sam Rivers, John Taylor and Django Bates come immediately to mind. Hermeto’s big band music is highly organized, (even the sections for squeaky toys and coconuts were written out) and generally scored for choirs of brass and reeds in the conventional way of block voicing, although with very unconventional harmonic language. This organization of the instruments is conveyed to the band through the printed parts. Mr Booth reports that the British band were “glued to the charts”; this is known in music as “reading” – is he suggesting that the band should abandon the parts in order to take part in a less mechanical, presumably more authentic fashion? It is possible that the 19 British musicians might have been used differently, and that is a matter for the promoter, composer and arranger – however Mr Booth chooses to belittle the “doughty” musicians themselves, who did the difficult but rewarding job asked of them to a very high standard. Hermeto and his fantastic band were extremely warm and complimentary about the British band, both in private and on stage throughout the entire gig. One can only conclude that the referee has had a shocker – 2000 people could see what happened and he seems to have totally missed it. Clearly there is a need for better understanding and higher professional standards or the game will be ruined in this country. I am really looking forward to the upcoming Big Air gigs, with the original line up of Steve Buckley, Oren Marshall, Myra Melford and Jim Black. We have some great new material and it is always a pleasure to play with such great musicians and old friends. I am very excited to be playing with Uri Caine this week - it's a great band with Jim Black, Chris Speed, Josefina Vergera, Steve Watts and DJ Olive. The gigs are at Manchester RNCM on Thursday 3rd and Birmingham Town Hall on Saturday 5th. The Vortex was packed and roaring last Sunday for the monthly Township Comets gig, which John Fordham covered in his 5* Guardian review of the London Jazz Festival - he also mentioned the band in his survey of the festival on Jazz On 3. Next Township Comets gig at the Vortex is December 12th. Old friend and fabulous tuba player from Big Air launches his new CD "Family Connections" on October 28th at Charlie Wright's, London. I played on a couple of the tracks, and the band features another old friend, Julian Siegel, on tenor. I recently recorded a Jazz Library programme with Alyn Shipton for BBC Radio 3 talking about the music of Harry Beckett, who passed away recently. I met Harry when I was a teenager, and he gave me some of my first paid gigs, even putting me in as a dep for Dudu Pukwana's Zila, a baptism of fire if ever there was one. It is a great honour to have the opportunity to pay tribute to Harry in this way. I am really looking forward to a new once monthly Sunday afternoon residency at the Vortex with the Township Comets. Some of my earliest playing experiences were at Dudu Pukwana's various South London Sunday gigs in the late 70's, and Pinise Saul and Adam Glasser will be playing Dudu's music at the Vortex, just as they were then. Starts September 12th.